A slightly larger take on the iconic Snapshot camera bag by Marc Jacobs, the ‘Softshot 21’ cross body bag mirrors most of its characteristics. Accentuated with polished gold-tone hardware, the structured, rectangular bag is crafted from pebble-textured calfskin leather that’s suppler and softer than the glossy crossgrain leather used to craft the original Snapshot. 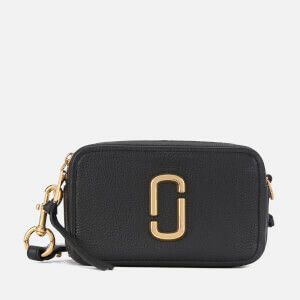 Embellished with a signature 3D double ‘J’ appliqué on the front, the Softshot is designed with a dual-zip fastening across the top to its twin-compartment interior, both which are lined with black grosgrain textile. An exterior patch pocket stitched to the reverse offers additional storage. Engraved metal dog lead clasps attach an adjustable leather strap for versatile styling. Complete with foiled branding embossed on the top and knotted, tasselled zip pulls. Protective dust bag included. Dimensions: H: 13cm x W: 21cm x D: 8cm. Strap Drop: 50cm.